Every now and then, while performing research on a piece of review equipment, I stumble on interesting bits of information that make me sit back and think, "Huh. How bout that!" A case in point: I was surprised to learn of the origins of Polk Audio, and how the company has come to be a keystone brand of home-audio equipment. In 1971, university buddies Matthew Polk, George Klopfer, and Sandy Gross were asked to produce a sound system for a bluegrass convention in Baltimore, Maryland. Polk, being a physicist, said hed design the system if Klopfer, then a cabinetmaker, would build the enclosures. Hands were shaken and a sound system built. But following the convention, the three were told that the producers couldnt afford to pay for it. Klopfer designed a logo and attached it to the speakers, Gross took on the role of marketing, and, in 1972, Polk Audio was born. Concentrating for a while on professional sound equipment, Polk Audio later focused its attention on high-end audio gear for the home. After the success in 1974 of their first model, the Monitor 7, Polk began to earn an excellent reputation in audiophile communities, and in 1999 the company went public. Today, Polk Audio offers a vast array of audio products, ranging from stereo and home-theater speaker systems to car and marine equipment. In the middle of their home-audio speaker range is the RTi series, which comprises three floorstander, two center-channel, and two bookshelf models. It is the smaller bookshelf speaker that I review here: the RTi A1 ($339.95 USD per pair).
. . . the RTi A1 is a magnetically shielded, dual-ported, two-way bookshelf speaker with a 1" silk/polymer-composite dome tweeter, a 5.25" polymer/mineral-composite mid/woofer, and two ports: one each on the front and rear panels. Housing all of this is one of the most impressive cabinets Ive seen on a stand-mount offered at this price or even quite a bit north of it. 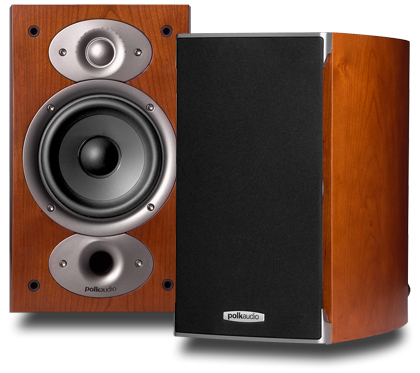 To my knowledge, Polk Audio is currently the only manufacturer offering real-wood veneers (Natural Cherry or Black Oak) on a $340/pair minimonitor -- the RTi A1s look is one of luxuriously high quality. Looking under the impressive skin of this cabinet, I discovered that its built using Polks Damped Asymmetric Hex Laminate Isolation (DAHLI) design technology, which is used throughout the entire RTi line. DAHLI -- basically, six layers of MDF separated by five layers of viscous damping material -- is said to create optimal sheer damping (OSD) to help eliminate cabinet colorations. In addition, the RTi A1s cabinet is internally braced, and has tapered side panels to further reduce internal resonances. The front port, just below the mid/woofer, uses a technology Polk calls Acoustic Resonance Control, which takes advantage of the cabinets internal resonance created by the back wave of the driver. Polk matches in frequency this form of cabinet resonance with the front ports tuning frequency. Since the ports and the cabinets internal resonances are out of phase, peak resonances within the cabinet are canceled, resulting, its claimed, in a more natural sound with reduced midrange distortion. The rear port, behind the tweeter, uses what Polk calls their PowerPort technology. Essentially, its a long, flared port with a dispersing cone mounted just past its end. This reduces turbulence in the air exiting the cone, thereby diminishing port noise, or "chuffing," while providing deeper, cleaner, more authoritative bass. In designing the mid/woofer and tweeter, Polk used a process called Dynamic Balancing, in which a laser is used to study the components of the speaker at a microscopic level, in order to reduce or eliminate behaviors or artifacts that color the sound. Finally, another process, Klippel Optimization, was employed to ensure that the RTi A1 offered balanced yet dynamic sound at both low and high volumes. All of these technologies came together to help this little bookshelf -- it measures only 12"H x 7.38"W x 11.5"D -- reach as low as 60Hz, -3dB, while maintaining an efficiency rating of 89dB. Such performance somewhat belies this minimonitors small size and affordable price. I set up the Polk RTi A1s in my 13 x 25 listening room on a pair of 24"-high stands, each positioned 1 from the front and side walls. Power was provided by an Arcam A18 integrated amplifier delivering 50Wpc through River Cable Starflex speaker cables, and all recordings were played through a Denon DVD-5910CI universal player connected via River Cable Audioflex Gold Plus analog interconnects. I toed-in the RTi A1s so that their tweeter axes crossed about 1 in front of my listening position, which allowed me to lean forward and compare their sound on- and off-axis. When I listened to "Train Wreck," from Sarah McLachlans Afterglow (CD, Network 30322 2), the bass was well controlled and rhythmic, and managed to do a surprisingly believable job of anchoring the soundstage. I was surprised because I had to keep reminding myself that there were only two 5.25" mid/woofers were providing all the bottom end I was hearing. Had I been less familiar with the speakers and had someone told me that there was a 6.5" woofer behind each grille, I might just have bought it. Voices were slightly more forward than Im used to hearing from my B&W DM601 S3s, and were delivered in a full, coherent manner that placed McLachlan at dead center stage. Changes in vocal texture and volume were clearly perceivable in softer passages, showcasing the RTi A1s terrific microdynamic abilities. At higher levels, the Polk sounded remarkably uncolored and detailed, and showed no sign of stress. In fact, one of the little Polks greatest virtues was its ability to paint the same sonic picture equally well at volumes low and high. Anyone living in an apartment or condo will appreciate a speaker that doesnt lose midrange subtlety when played at lower volumes. I then moved on to B.B. King & Friends: 80 (CD, Universal 6 02498 84246 1). "The Thrill Is Gone" was a logical choice to audition next with the volume level left high -- who listens to the blues quietly? The RTi A1s delivered a wide, holographic soundstage that was remarkably three-dimensional on axis, and only slightly less so off axis. Instruments and voices were delivered with fantastic realism and space, each clearly occupying its own place on the stage. I was impressed by how easy it was to distinguish the different layers of the music, and how well they corresponded with the depth of the soundstage. Had I been given a birds-eye view of the stage, I could quite easily have mapped out where each instrument (and B.B.) was positioned. However, the electric guitar on this track sometimes sounded a bit too sharp in pitch. This tended to worsen as the volume increased, but it was subtly tamed by replacing the grilles. This could be due, in part, to the fact that the grilles used on all RTi speakers were designed to reduce diffraction in an effort to provide a more natural sound. In "The Night We Called It a Day," from Diana Kralls The Look of Love (DVD-A, Universal 6 02498 61248 4), the singers voice was marvelously focused and positioned at high center stage. Piano notes were wonderfully articulated and filled the air, with a terrific tonal balance not typically heard through a minimonitor in this price class. That the RTi A1 was handling transients well was evident in the snappy sound of the cymbals and the level of detail audible in the sound of brushes slid over the snare-drum head. This speaker was no stranger to the resolution of fine details, especially when fed a hi-rez signal. But with this track the showstopper was, again, the bass response. Im not sure how Polk has done it -- perhaps a slight increase in midbass output, or all the technology poured into the exemplary cabinet design -- but the bass sounded as if produced by a much bigger bookshelf speaker, or even a small tower model. I got up to recheck the speakers placements, just in case Id accidentally moved them slightly in setup and thus stumbled on a hitherto unknown sweet spot in my room. Unfortunately, I hadnt; fortunately for the rest of the world, the RTi A1 was that good. Finally, I moved on to an old favorite, Pink Floyds Dark Side of the Moon (SACD/CD, Capitol 82136 2), and listened to "Us and Them." Once again, the highs were detailed and extended, with realistic amounts of space between instruments and voices. Nor did the "air" evident in the subtler passages disappear during the intense choruses, the result being a clear, dynamic presentation of a track that can sometimes sound rather congested through lesser minimonitors. While the bass line wasnt quite as compelling as with other recordings, I didnt find it lacking much -- the low frequencies were rolled off in just the right place, to imply what was missing. From so small a monitor, what more can you ask? While reviewing the RTi A1, I had on hand another pair of similarly priced, albeit slightly older bookshelf speakers: the B&W DM601 S3 ($450/pair, discontinued). The DM601 S3s larger (6.5") mid/woofer is housed in a cabinet roughly 20% larger than the RTi A1s, but, as the Polks have reminded me, size isnt everything. For most people shopping in this price category, a speakers appearance will be nearly as important as its sound, and this is something that Polk Audio has acknowledged. With its real-wood veneer, smoothly tapering side panels, and modern-looking grille, the RTi A1 wins my vote in the looks department. I began my listening to the B&W DM601 S3s at lower listening levels, with Leahys eponymously titled album (CD, Virgin 564147). The first thing I noticed in "The Call to Dance" was the B&Ws lack of low-level detail. These speakers didnt seem to come alive until I gave them some power. This could be in part due to the fact that, at 88dB, the DM601 S3 is slightly less efficient than the Polk (89dB), but it would surprise me if this were the only reason. The Polk, on the other hand, offered a nicely balanced sound regardless of volume level. Turning up the gain to give the B&Ws the power they needed brought things to life, albeit with a more relaxed sound. Leahys fiddle in "McBride" had a smooth, fluid, texture through the B&Ws that was very easy to listen to, whereas it sounded a little sharper and definitely more forward through the Polks -- similar to the electric guitar Id heard earlier on the B.B. King disc. I wouldnt say that one was better than the other; they were just different. Listening to the title track of Katie Meluas Call Off the Search (CD, Dramatico 0000266612), I was instantly struck by how coherent and alive her voice sounded through the Polks. Here, the RTi A1s slightly forward rendering of female voices made Meluas almost leap from the speakers, creating a genuinely involving and dynamic sound. The image focus was tight and clean, especially of the oboe, which seemed to float slightly above right center stage. The bass was smooth and punchy, and reached just low enough to not leave me wanting more. The B&W DM601 S3 lacked the Polks focus and dynamics, but offered a little something extra in the bottom end that prompted me to pump up the volume another notch or two. Here things got really interesting: the B&Ws began to sound midbass-heavy, almost boomy, and lost the smooth richness and control they had at lower volumes. Pushing the Polks hard gave me none of the hassles the B&Ws did; the RTi A1s kept their excellent composure while delivering very much the same quality of sound -- just louder. I have no doubt that this is in part due to their exemplary cabinet design, which allows the components within to do their jobs properly. Since 1974, Polk Audio has earned a reputation for building high-quality loudspeakers such as the RTi A1s, and for holding dear a few fundamentals. First, they understand that a good speaker, be it stand-mount or tower, must provide performance with two-channel music that is as compelling as it is with surround sound. After all, most average consumers who purchase home audio equipment will have it pulling just such double duty. Second, all of this performance and versatility must be offered in an attractive package at an affordable price. The Polk RTi A1 offers an impressively wide soundstage filled with convincingly solid bass performance, tremendous dynamics, well-focused voices, and a clean, detailed top end. If youre in the market for a speaker package that offers you a huge bang for your buck, I highly recommend auditioning a pair. Price: $339.95 USD per pair.